We are now six weeks away from the NHL trade deadline and the playoff picture is starting to take shape. But in the middle of the respective conferences, plenty of ambiguity remains. The upcoming stretch of games is pivotal for front offices as they try to get a feel for the quality of their teams. Across the league, teams will make key strategic decisions for short-term roster management and ultimately whether or not their clubs should act as buyers or sellers on Feb. 25. One of the interesting wrinkles at this point of the regular season is that schedule imbalance starts to take shape. We now have a pretty clear understanding of team talent across the league, and the reality is some teams will have a much easier road to the postseason than others. Depending on the team, this disparity can be rather significant. Take the Pittsburgh Penguins as one example. Mike Sullivan’s team had a rather slow start to the 2018-19 campaign, but a recent surge has them sitting second in the Metropolitan Division. But a glance at their remaining schedule shows just how much work they have to do. No team will have a tougher road through the second half of the season than Pittsburgh. They may have put enough daylight between them and the majority of teams in the Eastern Conference, but it does make you wonder if they can realistically chase down Washington for home ice in the Metropolitan. On the other end of the spectrum are the Minnesota Wild – another team that’s had an up-and-down season, but one that can position itself for a serious run over the next six weeks. The remaining January and February schedules for Minnesota show them with the second-softest schedule, based on expected opponent quality. To map out strength of schedule across the league, I rolled up opponent quality for every team in the league based on expected goal percentage, which better captures team talent than straight goal differential. I also appropriately weighted each team’s road/home splits and applied respective adjustments for ‘schedule loss’ type of games, which include (a) a team on a back-to-back playing a rested team; and (b) a team in a three-game-in-four-night situation playing a rested team. I mentioned Pittsburgh having a pretty brutal remaining schedule earlier. The other piece there is that Washington’s schedule for the next six weeks is actually reasonably light, with a healthy serving of home games against relatively weaker competition. I’m not sure I would count the Penguins out in the division considering how well they are playing right now, but it would seem that the marginal point gap in the standings could be bigger than what currently appears. The other divisional race in the Eastern Conference might be a little bit more interesting if there wasn’t such a significant delta between Tampa Bay and Toronto at the halfway point of the season. The Maple Leafs have one of the softest remaining schedules in the league, with plenty of games against the bottom half of the Atlantic Division. There’s also one fascinating draft lottery note here. Florida and New Jersey are relatively in the same position in the standings – about five wins back of the last wild-card position and, realistically, a more likely contender for the draft lottery than a playoff spot. But the Panthers will play a relatively brutal schedule through the trade deadline, while the Devils will play the easiest schedule of any NHL team over that stretch. Is it possible that we could see the Panthers better position themselves for a high draft pick while the Devils make things a bit more interesting in the Metropolitan? It sure seems like it. Look at Vancouver! 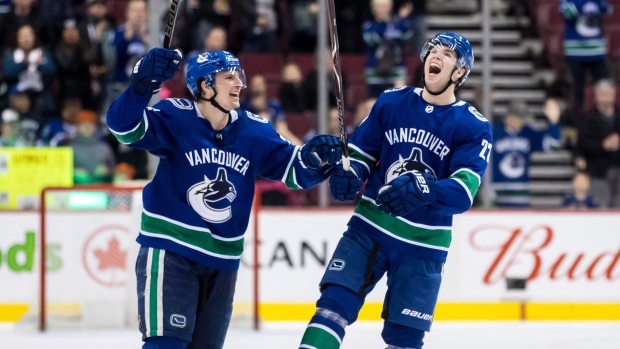 The Canucks have faded of late – in no small part due to Elias Pettersson’s injury – but they are still in the playoff race at this point. That’s thanks to some of the points they banked early in the season, as well as the fact that the second tier of the Western Conference has underwhelmed this season. The Canucks have a sizable run of home games remaining on the schedule, which is mostly collinear with avoiding some of the league’s elite teams in the Pacific Division. There’s a chance for a run here, no doubt. I’ll also mention Calgary. I wrote last week how critical I thought it was for the Flames to win the top seed in the Pacific, namely because the idea of falling to the two or three seed and running a VGK/SJS, VGK/SJS, NSH/WPG gauntlet to get out of the West seemed daunting. Outside of the Canucks, the Flames have the softest remaining schedule in the West – and perhaps more importantly, a relatively easier road than the likes of the chasing Sharks and Golden Knights. Both conferences have some fascinating storylines and in a few weeks, we will have a much better idea of the deadline intentions of the 31 NHL teams. But for now, we will have to sit back and watch as the next wave of games conclude.